While there are more than 90 species of antelope, their parenting styles generally fall into one of two categories. This is because of the varying ranges of these different species, as some remain within a specific range while others regularly migrate. The necessity of keeping up with the herd means that the young in certain species must be ready for travel within minutes of their birth. Antelope are spread across the Middle East, Asia and Africa, and habitat influences the ways that they breed. Because the wildebeest of southern and eastern Africa migrate during the dry season, for example, they breed solely during a one-month period near the end of the rainy season, when the herd is full and less susceptible to predation. By the time they give birth, the herd is almost ready to migrate, as all wildebeest do when changing weather patterns make food scarce. Non-migratory species of antelope, like the roan antelope of central Africa, have no such mating season and may be able to give birth as often as once a year. One thing is common among different species, though: they are non-monogamous, and the father does not typically play a role after mating. In the majority of species, a pregnant antelope leaves the herd shortly before giving birth, seeking out a hiding space like a thicket or secluded rock formation where she can deliver and hide her calf. After she gives birth, she leaves the calf hidden throughout the day while she goes off to graze. Like other calves, he is easily targeted by predators like lions and hyenas, because he is too slow and weak to escape or defend himself. His mother returns at dusk, and sometimes throughout the day, to nurse him. After approximately one to five weeks, the calf is strong enough to join her out in the open and graze for himself. Once a mother antelope brings her calf out of hiding, he can join her in the herd. However, not all antelope live in these large groups. Solitary antelope allow their calves to stay near them once they are out of hiding, but they do not stay close for the remainder of their lives. Instead, the calf remains with his mother until he reaches sexual maturity, which may not occur for two years or more. At that point, he leaves her in order to find a mate of his own. Not all antelope stay in the same area their entire lives. Some types, like the various subspecies of wildebeest, are migratory animals that constantly travel in herds, searching for food. 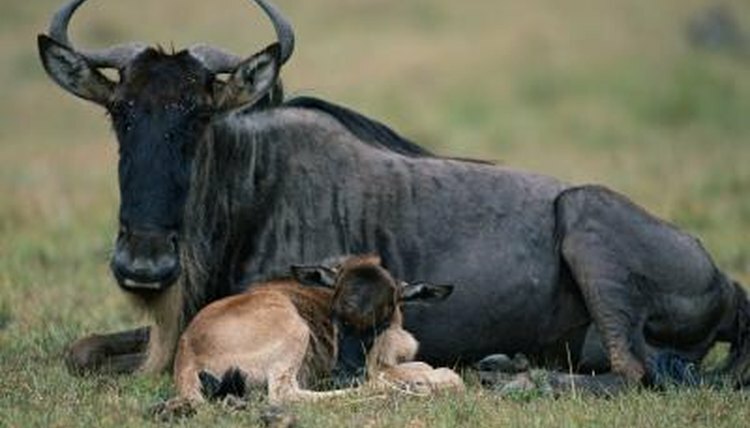 These creatures work as a herd to care for their young, so much so that they synchronize their reproductive season each year -- more than half a million wildebeest are typically born between February and March. The calves are ready to walk and join the herd in as little as six minutes, and as they grow, they stay near their mothers. Both their mothers and other adults in the herd actively protect the calves from predators until they grow strong enough to protect themselves. Though the young separate from their mothers after maturity, they are still able to identify each other among the rest of the herd.